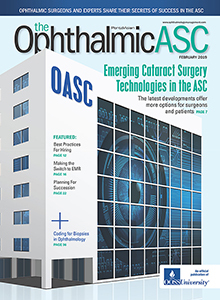 At OOSS, we gladly welcome new members to our community of ophthalmic ASC experts. We also strive to show our appreciation for returning members who to contribute to our success year after year. The Savings Advantage Membership Options are designed to reward both new and renewing members and are a smart way to save now while hedging inflation. Note that the 2 and 3-year renewal options apply to facility membership dues only, including President’s Council membership for one year only. Renewal notices will be sent to the Council designee and billing contact in advance of the anniversary of the last President’s Council renewal. For more information, contact Albert Castillo at acastillo@ooss.org. Please Note – Membership runs from January 1st – December 31st of each year.